Ensure the health of your new fish by acclimating them before adding them to their new home tank. Failing to acclimate properly is the most common cause of fish dying soon after they're brought home. Acclimation not only eases new fish into any temperature change, but it also prevents pH shock, caused by an imbalance of pH between the water in the pet store's tank and your own tank. The time it takes to acclimate properly depends on the initial pH imbalance. Ideally, new fish should be quarantined in a separate tank for two weeks prior to moving them to their permanent residence in the main tank. This allows you to observe the fish for disease or other problems without risking harm to your other fish in the main tank. If you have an extra tank available for quarantining, use it, but be sure to acclimate the fish to the quarantine tank just as you would for the main tank. If you don't have a quarantine tank, be particularly selective about where you get your fish, and don't buy fish from a tank with any evidence of disease or any sick fish. Also, never dump the bagful of water from the store into either the main tank or quarantine tank, to prevent the transfer of disease or parasites into your home tank. Prepare the tank by testing the pH and chlorine levels. Chlorine must be zero. Also, verify that the water temperature is suitable for the new fish. You will use the pH results when acclimating the fish. Turn off the light in the aquarium, to reduce stress on the new fish. Also, dim the lights in the room, if possible, or direct light away from the tank. Place the sealed bag containing the fish into the tank water so the bag floats. Let the bag float for 15 minutes to allow the water temperature to equalize in the bag. Open the top of the bag without letting any water into or out of the bag. Fold the open end of the bag over to create a hem with an air pocket to allow the bag to float upright. If necessary, fold the hem again. Test the pH of the water in the bag. Compare the result to the pH of the tank water, and note the difference. For example, if the bag water pH is 6.0, and the tank pH is 6.2, the difference is 0.2.
pH difference of 0.1 and 0.3: Add 1/2 cup of tank water every 15 minutes for 1 hour. pH difference of 0.4 to 0.8: Add 1/2 cup of tank water every 15 minutes for 2 hours. 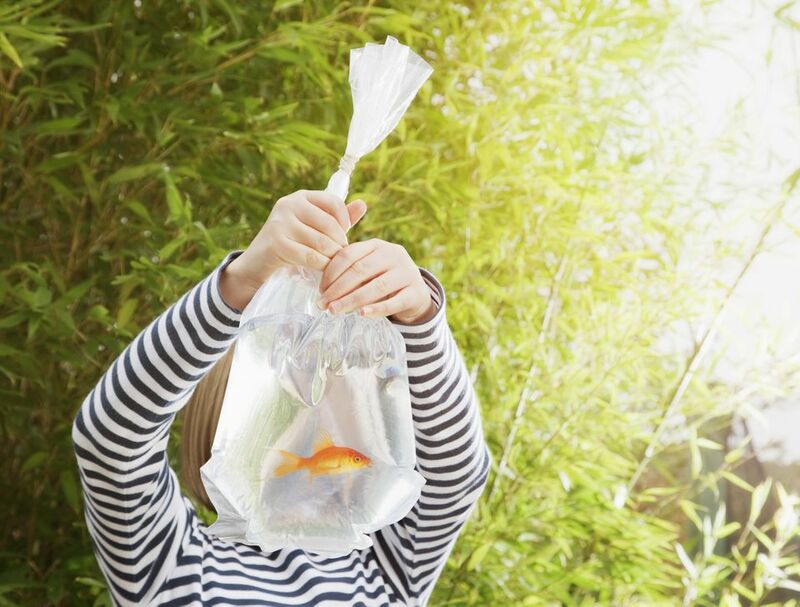 Use a small net to lift the fish out of the bag and quickly transfer them to the aquarium. Brine shrimp nets work well, but if you have only a large net, hold the net over a bucket and gently pour the fish and water into the net. Then quickly transfer the fish from the net to the tank. Discard the bag of water in the sink. Do not pour the water into the aquarium. Leave the light off for several hours to allow the fish to adjust to the new setting.